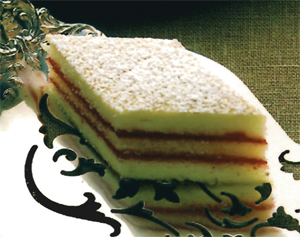 Recently, we were introduced to an Alexandria tradition: Shuman’s Jelly Cake. All we could say was, “Why have we never tried this?” For those of you who don’t know, a jelly cake is three thin layers of pound cake, separated by two layers of red currant jelly, topped with powdered sugar. It is light, sweet, and just amazing. And the story behind it is a great tale. In 1876, Louis P. Shuman established L. Shuman, Confectioner, which in the late 1800s moved to the historic Marshall House at 430 King Street. The family, including his son and eventual partner, Louis E. Shuman, lived above the bakery. The name became Shuman’s Bakery, and its signature product, the jelly cake, became a tradition at Alexandria family gatherings for 128 years. The bakery stayed a family-owned independent business until 2004, when the family retired and closed the storefront. 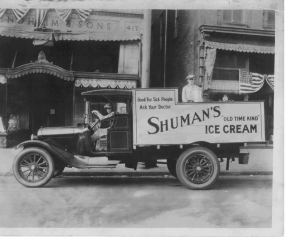 Then, in 2010, the family re-established Shuman’s, to the delight of Alexandria’s residents, including Alexandria native Willard Scott. Three of Shuman’s great-great grandchildren, Pat Hagan, John Leary and Marshall Shuman Hagan, now run the show. They no longer have a storefront but they have found a local baker who does their baking, following the family recipe. Orders are taken on their website, http://www.shumansbakery.com or by phone at 703-683-1876. They deliver for free in the 22301 through 22315 zipcodes or advance orders can be picked up at Alexandria Cupcake at 1022 King Street. Shuman’s also ships across the country, and even internationally. We wanted to take our own photo for this article but the cake disappeared before we could get one! And this was when there was Halloween candy in the house! This will now be a tradition in our house! Give it a try and let us know what you think.